$650.00 Badge of a Shock-worker of a Volunteer Fire Department of NKTP (Narkomat of Heavy Industry), #576, 1937-1939. Attractive and uncommon firefighter's award in fine condition. $90.00 Excellent Firefighter badge, #3741, Latvian SSR. In brass and enamel, three-piece construction. $195.00 Excellent Military Firefighter badge, "Classic Flat" version by Pobeda Factory, circa mid to late 1950s. In near mint condition. For more excellent soldier badges see "WW2 Excellent Soldier Awards" section of our website. $95.00 Document for Excellent Firefighter badge, issued in 1963 by the Ministry of Protecting the Public Order of Georgia. Correct for an early, 2-piece badge in brass. Very uncommon document in excellent condition. $20.00 Excellent Firefighter badge, circa 1970s-80s. $60.00 Badge for 40th Anniversary of the Soviet Fire Department, screw back version, 1958. Very attractive badge in excellent condition. Includes original screw plate. $45.00 50th Anniversary of the USSR Fire Department, 1968. One of the earliest fire department anniversary badges. $25.00 60th Anniversary of the USSR Fire Department badge, Novosibisk issue. $20.00 60th Anniversary of the Soviet Fire Department, commemorative badge, 1978. $20.00 60th Anniversary of the Soviet Fire Department, commemorative badge, Belorussian SSR. $25.00 60th Anniversary of the USSR Fire Department, commemorative badge, Dnepropetrovsk issue. $25.00 70th Anniversary of the Fire Department badge, 1988. $15.00 70th Anniversary of the Soviet Fire Department badge, 1988. $30.00 70th Anniversary of the USSR Fire Department badge, 1988. In brass and enamel. $20.00 70th Anniversary of the Soviet Fire Department badge, 1988. $25.00 4th Congress of VDPO (All-Russia Volunteer Fire Department) badge, circa 1970-80s. $20.00 5th Congress of VDPO (All-Russia Volunteer Fire Department) badge, circa early 1980s. $20.00 6th Congress of VDPO (All-Russia Volunteer Fire Department) badge, circa mid 1980s. $20.00 25th Anniversary of DPO (Volunteer Fire Department) of Kazakh SSR, commemorative badge. $65.00 Volunteer Fire Department Badge, Lithuanian SSR, brass and enamels, circa 1960. $40.00 Firefighting badge, Leningrad Volunteer Fire Department. High quality badge. $25.00 Participant's badge of Firefighting Exhibition by the MVD of Moldavian SSR, circa 1980s. $25.00 Championship of the USSR in Firefighter Sports, Kishinev, participant's badge, 1983. $20.00 Sports Federation of the USSR, Firefighting Sports, qualification badge. $20.00 Sports Federation of the USSR, Firefighting Sports, qualification badge, small version. $20.00 Badge of Honored Member of the Firefighting Sports Federation, Leningrad chapter. $20.00 10th Firefighting Championship of the Baltic Republics, participant's badge. 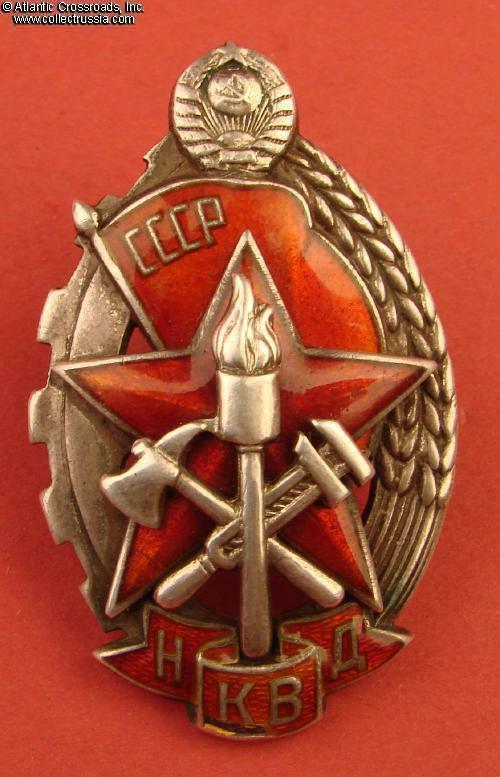 $25.00 Third Prize Winner's Badge, Firefighter Competition in Tallinn, 1987. $25.00 Fire Extinguishing Competition, First Prize Winner's Medal, circa 1980s. $15.00 Young Friends of Fire Brigade, circa 1950s-60s	Brass, enamels. Relief reverse variation in very fine condition. For more communist youth awards see "Communist Youth Medals and Badges" section of our website.